Calling all parents: YouTube is a mighty popular destination for kids, but not all the content there is kid-appropriate. 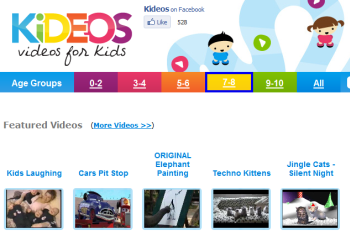 Send your toddlers and tweens to Kideos instead. The site serves up thousands upon thousands of child-friendly videos, from Animaniacs to Pixar shorts to Sesame Street to Word Girl (a personal favorite). All you do is click an age group (0-2, 3-4, 5-6, etc. ), then choose a "featured video" to watch or click into any of the dozens of available "channels." There's also a search option, natch. When you click a video, you're presented with a simplistic player--and none of the often-disturbing user comments commonly found on YouTube proper. My favorite Kideos feature? The free iPhone companion app. When you need a five-minute break from screaming in the car or the kids are getting restless at the restaurant, presto: child-friendly video on the go. Just one word of warning: Avoid that insidious "Gummy Bear" song at all costs. You'll never get it out of your head!